The Lebanese Autism Society –LAS is a non-governmental organization (registered by official decree No.19/AD dated March 10, 1999). The LAS was founded by parents of and professionals working with Autism. To this date, more than 500 members joined the Association. 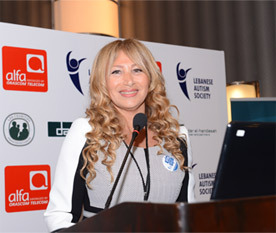 LAS is a founding member and the coordinator of the Arab Network for Autism (ANA). LAS is also a member of different national and international organizations such as AutismEurope, World Autism Organization, United Nation Global Compact. "As a mother of a child with Autism, the diagnosis of my son was devastating; and the lack of support and services for Individuals with Autism and their families in Lebanon at that time pushed me and some parents in the same situation to start up an NGO catering for the needs of individuals with Autism and their Families. My purpose was mainly to help families with the diagnosis of Autism and give them the support I didn't have." Mrs. Arwa El Amine Halawi, President of the LAS. To enhance the well being of Individuals living with Autism in Lebanon. The LAS mission is to advocate for the rights of individuals with Autism and to provide them and their families support and services, from early childhood through adulthood. Early diagnosis and intervention emphasizing the development of highly structured, specialized educational programs tailored to the individual needs of children with Autism Spectrum Disorder and other disabilities. The promotion and support of the social integration of children and teenagers with Autism. Building capacities of professionals and institutions providing services to children with Autism in Lebanon. Spreading public awareness in regards to Autism and Autism Spectrum disorders.